Social Media continues to grow in popularity, especially as new apps and sharing networks seem to be created everyday. Week 11 has us focusing our attention on social media networks, and how a brand needs to design for the different channels; more specifically though we focused on Facebook, Twitter, and an Instagram image overlay. For this showcase assignment I decided to design a fall campaign for Norwegian Cruise Line (partially because I hope summer never ends) and because they tend to create fun ad campaigns. I thought back to week 9 and 10 when I designed a campaign for back to school and thought about how if kids went back to school this might be a “down” time of the year for family cruise vacations. 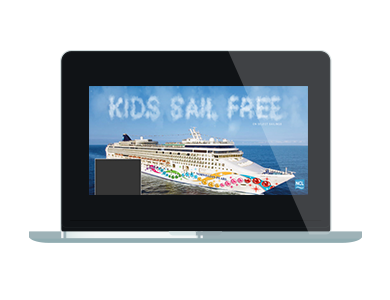 In order to entice families to still vacation in the fall I thought Norwegian Cruise Line could have a “Kids Sail Free” campaign. When I went to their website, they currently are already advertising for this, so I decided to run with it since their social networks do not have cover photos highlighting it. The second design inspiration came from a photo I saw on their website, it was of a child splashing his family. I thought this was an awesome photo to use and created the text slogan along the left side with a low opacity white background. The text on their currant ads are very basic san serif fonts, so I chose a similar one as well as used the orange and blue seen throughout their website. For my third design I decided to create another spin on the writing in the sand, this time focusing on a cruise ship and the sky. I thought it was be great to write the slogan in the sky since as a kid I always used to love thinking of shapes that clouds looked like and thought it would had to a “kid” campaign. I was able to find this tutorial to help make it happen. It took me probably over 10 tries, every time my clouds just came out too light so I’m not sure if it was the type of brush I was using, but finally I was able to end up with something that made it work. I also added various clouds to the original sky to help the created ones blend in. I did add the small disclaimer about select sailings for the special just because I wanted it to be upfront. It was now time to begin working on my Twitter cover photo, since the dimension are a little more gracious in spacing (1500x500px versus 851×315 for Facebook) I decided to make a layout of kids having fun on Norwegian cruises rather than focus on just one photo. I designed it in a way that even if the user views the site on their mobile device no ones face is covered. I also chose not to use any text so I wouldn’t overlap any images and hide how much fun the kids are having. Lastly we were asked to design a logo-esque image that Norwegian could place on their Instagram photos for this specific time period. I decided to add “fall” into my design with the slogan “Norwegians fall in love with savings”. I also added their curved line that is on the bottom of their logo. The new tag line allows them to use this overlay on various images and doesn’t limit the sale to just a kids sailing free campaign. Looking through my designs there are two in particular key design elements that I used to create a sense of IMC across the different social networks. This was done through the use images with kids in them as well as using “kid like” elements throughout the design as well as in the text. 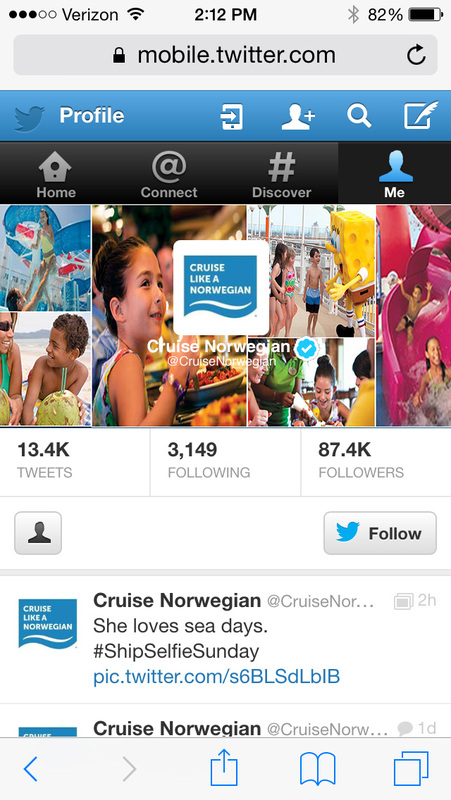 For example, the Twitter cover photo as well as the Instagram photo contains images of kids on the cruise, (as well as one of the Facebook cover photos). The other two Facebook cover images highlight the “kid like” concepts, with the writing in the sand and making shapes out of clouds. If Norwegian Cruise Line wanted to include two additional features on Facebook I think they could create a short video to post on their page that would highlight kids having fun on the cruise and showing different activities the kids can do. This would also be a great way to engage the user past just still photos and really show how much fun kids can have on a cruise through their emotions. 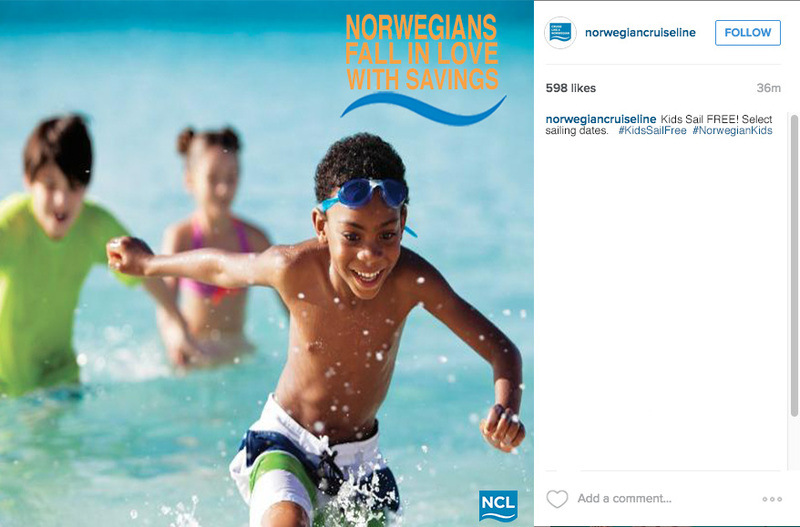 For another way to engage the users, Norwegian can post a timeline photo that one of their customers shared of their kids having fun and their caption; and then add that currently kids can sail free on select sail dates. This could also entice their customers to share their photos in the hope of being re-shard on the brands Facebook page. To enhance Norwegian’s social networking experience with their customers they can become a user on Snapchat, which would really engage their customers. They can either create filter images which if the user in on the ship and has their location selected, that picks up that they are onboard, can add an image overlay for them to add to their photos that they share. As well, their company username can share the snaps that has been posted on their snap story to showcase how much fun their customers are having on their cruise and again would entice them to share in the hopes of being features on their snap story. Another networking experience that they would benefit from having would be an account on YouTube. Photos are great, but videos are really able to engage the consumer especially if the brands creates an experience, such as travel, it is best to view through videos because you can get a sense for the atmosphere and can connect on an emotional level. They can even share the YouTube videos on their Facebook page posts that I mentioned earlier to link the accounts together so if a user likes a video on their Facebook page they can click on it and it will take them to their YouTube page where they can find others. I think this was a great showcase assignment and really shows how social networks have affected brands and how they need to account for additional considerations to stay consistent and in touch with their consumers.